Did you know we can come to visit you at your home? We offer a full home visit service. 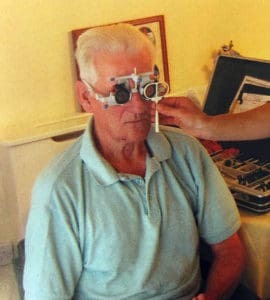 Many people are housebound, and require eye care, but do not know that they are entitled to free NHS eye tests in their home. How do our home visits work? If you need glasses, a trained dispenser will be there to help you pick a frame from a range of frames that we will bring to you. To find out if you’re eligible for a free a home visit, contact us on 0800 979 0939.